January is just around the corner. So if you’re looking for some tips and insight to start the new year off right, here’s a list of free non-profit webinars that might help. We’ve gathered a list of 25 webinars on topics such as: harnessing the power of video; non-profit corporate compliance; non-profit blogging that engages and much, much more. What’s an Asking Style and How Do I Use Mine? Everyone has their unique way of asking for donations. Do you like sharing stories about your organization? Or do you like facts and figures? Are there particular donors you feel more comfortable asking? What’s the best way for you to prepare to go out and ask for donations? New strategies that can help your program grow. New ways to really analyze your direct response program. Which direct response metrics are critical to setting appropriate strategy. How to use analysis to gain the support of the program from key constituents. How to present your results to avoid cuts to your program budget. (And even gain investment). The Accessibility for Ontarians with Disabilities Act (AODA) was legislated in 2005 and affects all aspects of community and business life. Board members are legally responsible to ensure that their organizations meet the requirements of the AODA, within the timeframes set by the law. The first set of compliance deadlines was January 1, 2012 and new ones will occur every year until 2021. This webinar has been specially designed (by Accessibility Ontario) for Board Members and will give you the key information you need about the AODA and each of the standards. You will gain an understanding of the legislation, the legal requirements of your organizations, and what you need to do as a board member to ensure that your organization is compliant. At some point, even experienced trainers, facilitators and managers find themselves standing before groups whose dynamics are all over the board. Everyone is expressing an opinion, ideas are flying at warp speed, emotions are high, disagreement is rampant, and some people are shutting down while others are rebelling against the process. Wouldn’t it be great to have the tools that allow you to regain control and confidently lead the group to effective results every time? Join us and learn practical facilitation techniques to elevate your group handling skills and help you achieve amazing organizational results. We will include a case study illustrating a corporate-nonprofit partnership. This Giftworks webinar is designed to equip nonprofit professionals with the knowledge and skills to begin confidently using video. We'll discuss the importance and possibilities of video, what's needed to get started, and the top five tips for creating a quality video yourself. You'll leave this presentation with a clear cut plan for how to get your organization creating videos that drive engagement, boost volunteer numbers, raise funds and execute your mission. Want some great reasons for your charity to take any and all non-cash donations? Wonder why other charities seem to increase their fundraising in good years and bad years, quickly build up their endowments, have the resources they need? Well, find out in the webinar. In this Giftworks webinar, Sam Davidson will share key principles from his book Simplify Your Life that apply specifically to the nonprofit workforce. Suggestions will be given for ways that nonprofit warriors can be committed to their cause while also knowing when to say "yes" and "no" to the right and wrong opportunities. Participants will leave with a process by which they can focus on what matters most to themselves and their organizations in order to truly achieve better work/life balance. Learn how to plan and build a site which not only has a lot for the user to see, but a lot for the user to do as well. Consider the impact of a site that offers online donations, event tickets, membership dues, e-store purchases, affiliate marketing, even in-kind donations, planned gifts, investment donations, and much more. Are unresolved conflicts affecting team functioning? Would you like to make conflict a source of growth for your team? Would like a road map to get there? Learn how to keep your team members engaged and committed. 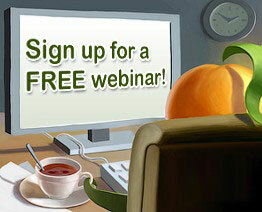 If your organization offers a free webinar that would be of interest to non-profit, membership or volunteer-based organizations and you want to include it in next month's post, please email an overview (like those above) to lori@wildapricot.com no later than January 15th. And, as always, if you know of a free webinar that we've missed for this month -- please share the details with us.